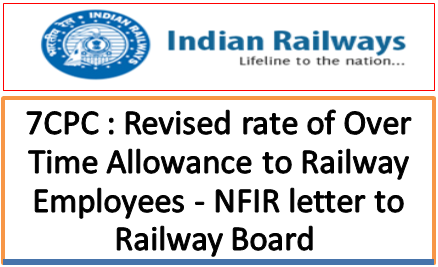 Sub: Revision of Over Time Allowance to Railway employees consequent upon revision of pay scales and allowances-reg. (ii) Railway Board’s letter No. PC-V/2017/A/OTA/1 dated 28/11/2017. (iv) NFIR’s PNM Agenda Item No. 6 sent to Railway Board vide letter No.NFIR/PNM/l 11 dated 04/01/2018. v) Railway Board’s circular No. PC-V/20 17/A/OTA/1 dated 20/03/2018. After issuance of instructions by the Railway Board vide letter dated 28/11/2017 (RBE No. 175/2017), Federation has again requested the Railway Board vide its letter dated 11/ 12/2017 to give effect the revised rates of Over Time Allowance from 01/01/2016 instead from 01/07/2017. NFIR, therefore, requests the Railway Board to issue corrigendum to Board’s letter dated 20/03/2018 duly mentioning NFIR’s PNM Item, duly endorsing copy to the Federation. Federation has again requested the Railway Board vide its letter dated 11/ 12/2017 to give effect the revised rates of Over Time Allowance from 01/01/2016 instead from 01/07/2017.